The Dripping Springs Ranch is located approximately 50 miles northwest of Silver City, Nm, and approximately 60 miles east of Safford, Az. The Dripping Springs Ranch is located just southwest of the town of Mule Creek in the Gila National Forest. The Mule Creek area is one of the most sought after ranching communities that the southwest has to offer. Rarely do Ranches in the Mule Creek area come on the market. The Ranch is permitted to carry a total of 150 head of adult cattle and 4 head of horses yearlong. The Dripping Springs Ranch has a mild year-round climate with summer highs in the mid 90’s and winter lows in the mid 30’s. Rainfall is approximately 16 inches annually. Elevation of the Ranch varies between 5,000’ in the lower country to 7,000’ on the mountain tops. Most of the Ranch is Grama grasslands, with side oat grama, blue grama, black grama, hairy grama, being the primary species. The upper country is dotted with oak, juniper, cedar, and ponderosa pine trees, with a wide variety of browse. The Ranch is highly improved. At the headquarters a Ranch house, of approximately 3,000 sqft. 4 bed, 2 bath, and one approximately 700 sqft., rock Bunk house with kitchenette and bathroom. Both homes have been remodeled/renovated in the last few years. One hay barn, one shop, tack rooms, feed rooms, and an excellent set of steel working corrals with covered scale and loading chute. There are currently 3 sets of working corrals, The Headquarters Shipping corral with Squeeze Chute and Calf table, Sunflower corral, and Sawmill corral with numerous Powder River, and Priefert livestock gates and panels. The Ranch is crossed-fenced into 5 pastures, with numerous traps for ease of management. All fences are in excellent repair. 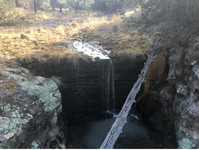 Water improvements are exceptional with 4 wells, (1 windmill, 2 solar and 1 electric submersible), pipeline, storage tanks, and troughs all in great condition, there are also 11 dirt/stock tanks (4 of which have been cleaned in the last few years), and 4 developed permanent springs with numerous seeps throughout the Ranch. The Ranch has Several Cement Dams some holding water others retaining riparian area behind them. The Dripping Springs Ranch is a highly improved working cattle ranch in a very desirable part of southwest New Mexico. Access to the Ranch from State Route 78 is excellent, and it is an easy drive to either Silver City, Nm. or Safford, Az. Rarely does a Ranch of this quality, come on the market, and almost never in the Mule Creek area. This is truly an opportunity of a lifetime.